Will Bitcoin price reach $1 Million U.S. Dollars? Bitcoin’s price versus the US dollar is the most searched keyword for Bitcoin, along with “What is Bitcoin?” The Bitcoin price is important under many circumstances, primarily exchange rates with any fiat currency, which are based on US dollar rates to some extent. Now that Bitcoin’s price has more than doubled since January, the Bitcoin trolls and haters are noticeably silent this holiday season (funny how that works). Now that the good times are rolling, again–for Bitcoin as a global currency and an exchange of value–how far can this go? What is the ceiling for “the future of money”? Some in the mainstream have actually been beating the drum in favor of Bitcoin as a long-term investment. Henry Blodget of Business Insider used Bitcoin’s peaking value (back during the Mt. Gox bubble in the fall of 2013), to pontificate a $1 million value down the road. That article received over 100k views, at a time when Bitcoin couldn’t have been more exciting to the mainstream, leaping from $125 USD to over $1000 USD in one fiscal quarter. 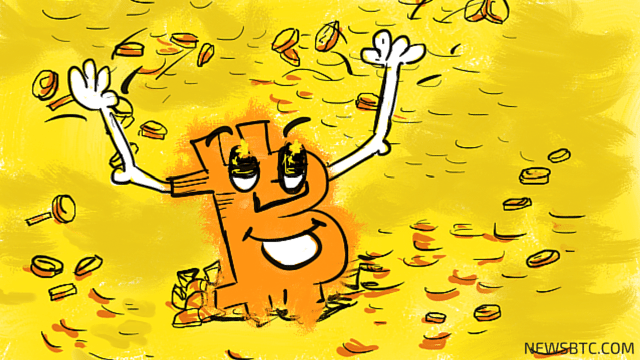 Recently, The Street took Bitcoin blogger Datavetaren’s word in a recent interview that not only will Bitcoin reach $1 million USD in value, but it will replace gold as the economic “safe haven” of choice. In a Bitcoin bull market, are we just taking a trip to Fantasy Island, or is there real digital gold in these economic graphs, long-term? If you look at Bitcoin from all sides, it is hard to come up with a failing conclusion, if you go out far enough. As Nick Cary tweeted this morning, Bitcoin daily transactions are setting records this holiday season, passing 100k per day, so demand and usage are at all-time highs. As Bitcoin price continues to increase, the mainstream media struggles to castigate the digital currency. Bitcoin will undergo a halving next July, dropping production to 12.5 BTC every ten minutes, which certainly won’t hurt Bitcoin’s price in the long run. This may cause miners to sell more Bitcoin holdings to maintain operations in the short-term, so there will be attrition at play. This can act as a counterbalance to the natural appreciation, at least for awhile–don’t expect BTC values to double by next fall, but I would be bullish over time on Bitcoin values. When demand, which is increasing steadily, swamps supply, prices rise over time. A factor no one talks about is the long-term value of the “global reserve currency,” the dollar itself. The US government will tell you inflation is a mere 2% at worst, and many times, they’ll even say there is no inflation at all if you let them. Anyone who has bought a car, a pound of beef, or a bitcoin for that matter will tell you otherwise. Real-world inflation–not the contrived and manipulated CPI–is more like 5% per annum, not 2% or less. Many experts are also forecasting the end of the U.S. dollar’s run as the global reserve currency by the end this decade. Superpowers like Russia and China are working night and day to upset the global economic dollar-based shopping cart. The AIIB (Asian Infrastructure Investment Bank) and the BRICS (Brazil/Russia/India/China/South Africa) have created a we-hate-the-dollar investment bank, and new Silk Road construction from China, through Russia, into Eastern Europe are all signs of a geopolitical economic shift for the ages. In an environment where the U.S. is $18 trillion in debt, where non-dollar denominated bilateral trade agreements are the norm and countries worldwide are using the Chinese yuan for global exchange, the US dollar is on the clock. It’s not a matter of if, but when there is a changing of the guard. The dollar has lost over 97% of its value over the last century, and why wouldn’t that model of consistent economic debasement continue? Bitcoin’s value is being rated against a depreciating paper asset with a bad heart. We all do this by default, but I could write 3000 words on why a bitcoin is more valuable than a dollar, and the market agrees, obviously. In the end, the question may not be how many dollars a bitcoin is worth–every fiat currency known to man has collapsed, and the U.S. Dollar will be no different. Its final destination will change the future of money even more than Bitcoin will. I have no doubt a Bitcoin will be worth $1 million USD, not so much because of the strength of Bitcoin as a global currency, but because of the inherent weaknesses in the US dollar going forward. Global support and confidence in the dollar is fading while Bitcoin continues to rise. “The Third World” hasn’t even grasped the value of Bitcoin yet. The billions of dollars invested is still 1-2 years from bearing fruit, making Bitcoin easier and more capable to use, worldwide. Bitcoin has proven its mettle, and it’s still in the foundation-building stage of its development arc. It may take a decade, but Bitcoin value is not something worth worrying about, over the long run. The only real question is: will your investment be there when it does?